[spoken in old-timer twang] Time was picking keywords for SEO was a fairly straightforward task. You’d identify what you did, you’d figure out what terms searchers used to find your service, then you’d pepper those terms throughout your site. At a basic level, not much has changed; determine your brand’s area(s) of expertise and find how that overlaps with what your buyers are searching for. As marketers we’ve come a long way from this “straightforward” way of ranking and thinking. Where we used to target the explicit keyword, we now identify variations (themes) of the keyword to improve the site’s overall relevancy. So, a keyword theme is the main keyword itself, plus all the relevant variations of that keyword. This creates a list of keywords that are connected by a central theme. Are you currently ranking for core keywords? If so, start there. What variations are relevant to your brand/website? Are you currently ranking for core keywords? This one should be relatively simple, assuming of course you have a good idea what keywords align with your brand/website. If you don’t have a good idea what keywords are relevant to your brand/website, then this article on Search Engine Watch will help guide your way. Once you have your list of keywords, there are a few tools that will show ranking. Tools we like are Moz, RavenTools & the mighty Small SEO Tools Keyword Position checker. What keyword variations are relevant to your brand/website? 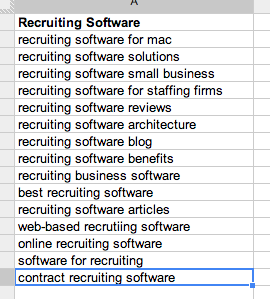 Now we have a list of words that we’re ranking for (or would like to rank for if you’re new to the SEO game). Next we want to find extensions of those words and build out our themes. For example, let’s say my company sells web-based software to recruiting firms and I have two core keywords that I’m currently ranking for; “recruiting software” and “applicant tracking system”. Both of these terms are directly applicable and represent the product my company sells and they are the terms my potential customers (recruiters) use when searching for my type of solution. Ranking for these core keywords is great, but we can do better by adding variations to capture long-tail searchers. Themes extend your website’s reach for searchers and search engines alike. With keyword themes, you are positioning your site as the subject matter expert for everything relating to your core term. This can be used on focused topic pages or throughout your bigger content marketing plan. For the screenshot above, I used a tool called Übersuggest. Übersuggest makes it easy to expand a core keyword by offering variations that are related, but offer different intents. A couple of other tools you can use (for free) are the Adwords Keyword Planner and even the predictive search feature in the basic Google search page. To summarize everything, keyword themes help you roll in more relevant keywords into your site content. By doing so, you extend your brand’s expertise in the minds of buyers and search engines.